Difficult colleagues, dysfunctional teams and defensive employees all add to workplace conflict and tension. However, these interactions need not be the energy sapping , tense conversations we dread. You can use the “Poise Now” model to create an action plan so you can run difficult conversations smoothly. Learn how to harness your composure to keep you calm and in control and disarm defensiveness with integrity and respect. With this model, conflict at work and dealing with ‘difficult’ people can become a catalyst for change and foster improved relationships and greater productivity. 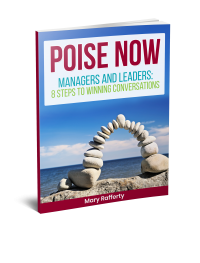 By downloading my free eBook, you consent to receiving regular emails from Consensus Mediation, with tips and suggestions on dealing with difficult conversations and conflict, along with the occasional promotion for my products and services.